Ever wonder why Cobalt Boats are so popular on the River? Take a closer look – or better yet get behind the helm of one of them – and the the answers will become clear. The sleek craftmanship, luxurious interior design and agile performance make Cobalt one of the best rides on the River. Cobalt Boats have been sold by Ed Huck Marine in Rockport for the past 20 years. Based on the Canadian side of the River, Ed Huck Marine is also the Cobalt dealer for US based boaters that make both sides of the 1000 Islands their world famous boating playground. Our customers arrive from all over the USA and indeed the globe because of what the 1000 Islands has to offer – arguably some of the best fresh water boating in the world. Cobalt Country: Ed Huck Marine co-owner Scott MacCrimmon in front of Zavikon Island’s international bridge between Canadian and American waters near the historic Rockport marina. In fact, a recent online contest in USA Today voted the Thousand Islands The #1 Best Boat Ride in America. 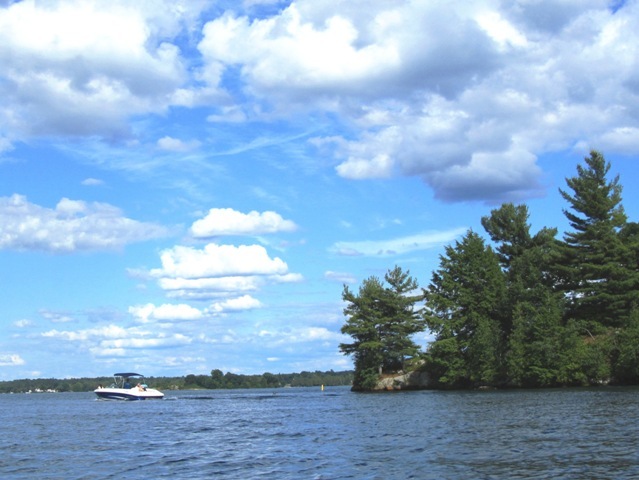 The Thousand Islands includes Canada with an estimated 1,865 islands between Kingston and Cape Vincent and Brockville and Morristown. So technically the best boat ride in America is in Canadian waters too. It’s a unique destination: One River: Two countries. And an incredible archipelago of Canadian and American islands with castles, cottages and park sites to explore. USA Today online recently rated the Thousand Islands in an online poll as the #1 best boat ride in America. Boaters get to enjoy the best boating in North America in Canadian and American waters here. Ed Huck Marine services both side of the border. Many folks might think that buying a boat in Canada would be confusing. But we’ve been taking care of northern New York boaters for over 100 years. The Cobalts and Boston Whalers we have in stock are held in USD so there’s no currency conversion to deal with. Additionally, any boats we sell to USA residents are not Canadian taxable. The buyer simply pays their state tax where they register the boat. It’s that simple. What are you waiting for? Ed Huck Marine has been selling Cobalt Boats for 20 years. Ed Huck Marine has been hosting its annual Cobalt Cruise for the past 15 years. Once a year, Cobalt owners cruise the River for the day as a group and dock at a famous 1000 Islands landmark for dinner and camaraderie. The event is being held this year Saturday July 12. Ed Huck Marine has been hosting a Cobalt Cruise for Cobalt Boat owners for the past 15 years. Cobalt Boats and Ed Huck Marine are both family businesses with multiple generations actively running the respective operations on a day-to-day basis. This summer Ed Huck Marine celebrates its 125th anniversary with fourth and fifth generations owning and operating the business. (My brother-in-law Peter Johnston and I celebrate 20 years as co-owner this summer). In 1968, Cobalt founder Pack St. Clair started building runabouts in land-locked Neodesha Kansas. Today, Cobalt manufactures its quality brand of power boats including bowriders, cuddies, and cruisers ranging from 20 to 46 feet. Ed Huck Marine is one of Cobalt’s carefully selected dealerships in the United States, Canada, Australia, South America, Asia, the Middle East and throughout Europe. Cobalt’s industry leading warranty coverage along with Ed Huck Marine’s on-water accessibility – 7 days a week in season with our technicians to keep things running smoothly make the brand a popular consumer choice. Check a Cobalt Boat out at Ed Huck Marine and experience one of the best boat rides in North America in the heart of the Thousand Islands: Cobalt Country.